Put your mouse over the image for labels. 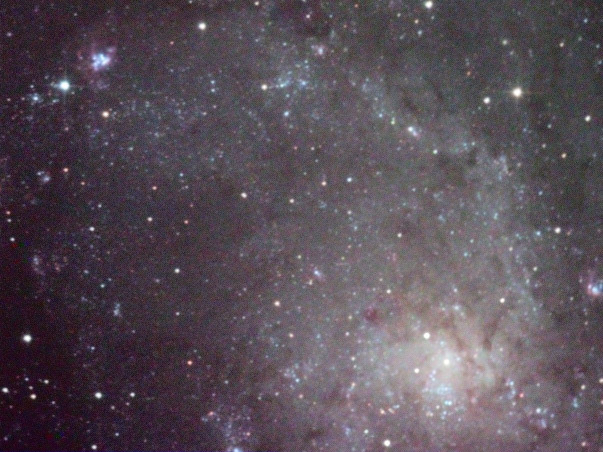 This image shows the bright starclouds of part of the M33 galaxy. NGC 604 is the bright blue/red nebula in the top left. NGC 604 is a giant star forming region some 1500 light years across. There are many catalogued objects in this field. The smaller nebula on the extreme right hand edge is NGC 595, the region just left of centre bottom is IC 135. IC 143 and IC 142 form part of the arm between 604 and 595. Visually this field is very impressive and rich with colour. However, there appears to be vignetting of the L layer in the bottom left and up the left hand edge. This may be me being a twit with the filter holder, or could be a more subtle timing issue with the camera. As with previous images, a green hue on the right seems to predominate. Concentrating on NGC 604, I was impressed to see the delicate red structure around the main nebula. There is a suprising amount of detail in the region. The dark lanes in the M33 host galaxy stand out well, especially in the core. There is a lot going on in this image! I rather enjoy these closeup shots (see NGC 206 as well) of our nearby galactic friends more than the wide field images of these regions. The longer focal length makes a pleasent change. If anyone says "mosaic", I am going to pretend I didn't hear them... colour mosaics of this region are hard work. See my effort last year. Captured in k3ccdtools with BW SC3 toucam webcam. autoguided with k3ccdtools. Each of the 4 avis stacked in registax and exported FIT32. Coregistered and colour scaled in IRIS. Colour layer exported from iris as psd. L layer fits and colour layer combined in photoshop. Curves on L and colour layers. 50% with darken faded minimum filter on highlights of L layer. Multiple LLRGB layering to produce final image.